Step1.Click Start->All Programs->Microsoft SQL Server->Configuration Tools->Reporting Service Configuration Manager. Step2.Specify the Server Name and report server instance.Click Connect buttton. 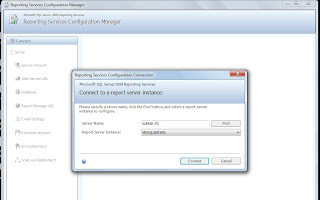 Reporting Service Configuaration Manager window opens to show the status of current report server instance. Step3.Select Service account tab from the left pane of RSCM window to open the service account page. You can get an option choose service account by choosing the radio button in the above figuure and Click Apply Button. Step4.Select the Web Service URl tab from the left pane of RSCM window to open the Web Service URL Page as shown in the below figure. Configure URL to access the report server and also you can specify more than one URL to access the same Report Server. Step5.Select Database tab from the left pane of RSCM window to open the Database page as shown in the below figure.